I've been checking my DNS options and I have DYNAMIC set in my ZyXEL VMG8924-B10A, when I run a DNS Benchmark it reports '192.168.1.1' as being the fastest, when I enter Plusnet's DNS (212.159.13.49 + 212.159.13.50) to be tested alongside it I get differing results, I am wondering if the result for the router is incorrect (min 0ms / max 1ms - whereas all others are circa 12ms). Am I correct in thinking that the router result of 1ms is simply the time it takes for the router to respond rather than actually delivering a DNS query result? Am I correct in thinking that the router result of 1ms is simply the time it takes for the router to respond rather than actually delivering a DNS query result? Plusnet DNS is vey inconsistent. I use 1.1.1.1 with 8.8.8.8 as backup. I would expect the 1ms to be the time the router takes to deliver a DNS query result that it has got already cached. The cached explanation sounds like what's happening here as it reports other 'normal' results for un-cached etc via Steve Gibsons DNS Benchmark, with that in mind it would be best to leave it on 192.168.1.1 with the DNS server set in the router. 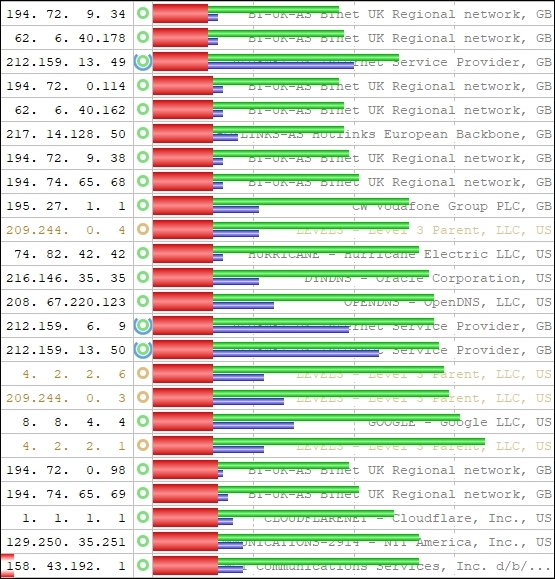 Have you tested 1.1.1.1 and 1.0.0.1 which claimed to be the fastest by cloudflare.